We’ve finished renovating the smaller of our two buildings – it was the easiest one, and also the most urgent to move into because the Krishna.com web department needed the much-better internet connection offered at the site. The space also is home to several of our local Bhaktivedanta Book Trust staff. How can you thank someone who has been working here at Krishna.com for eleven years? Amazing! A quick email to let you know about a big deal!!! The two things about shipping are 1) you get what you pay for, and 2) we only charge our customers what we pay. The major problem is that we're not a big company like Amazon.com, so we don't have the weight to negotiate amazing shipping rates with shippers. I have to be honest. I’m looking towards the end of this month with dread. The US Post has announced a rate increase, and it looks like it’s going to be a big one. If only we were up there with the likes of Amazon.com, it wouldn’t matter so much. But we’re just Krishna.com. Way back in October 2009, we started our first ebook club. It's coming to an end finally after 2 years, 9 months! Way back in October 2009, we started our first ebook club. The idea was to email out one page of the Bhagavad-gita, about five minutes worth of reading, every weekday until we reached the end of the book. Because everyone in the group was reading the same pages every day, we also offered a forum on Krishna.com where readers could go to discuss what they were reading with each other. How can you run an internet 'business' from the cow pasture where the internet suddenly disappears from time to time? And how do you know when to let go, and let Krishna fix it for you? I clearly don't know. It’s lovely to site here at my desk and look out over the cow pasture some days. Every so often one of the retired oxen or cows will slowly walk by (they always look over at us in case we have leftovers or extra veggies for them). I can see a rainstorm sweeping in across the pasture, or hear the wind in the trees outside. It’s very relaxing and centering to be this close to the real world instead of the city. 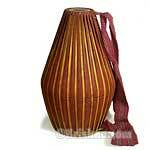 What is the price of a leather mridanga drum? One cow? One human? A lot of people have been asking why we only have the Balarama brand fiberglass mridangas drums in stock now. Where are the clay, brass, and fiberglass drums from India that we have imported for all of these years? They sound better, look better, and play better than these Western versions do. Well, the answer is in the leather. Cow hide. We don’t kill cows. It’s intrinsic to our belief system and our lifestyle. We just don’t do it.